Homeries has developed the perfect addition to your kitchen, the bagel slicer! 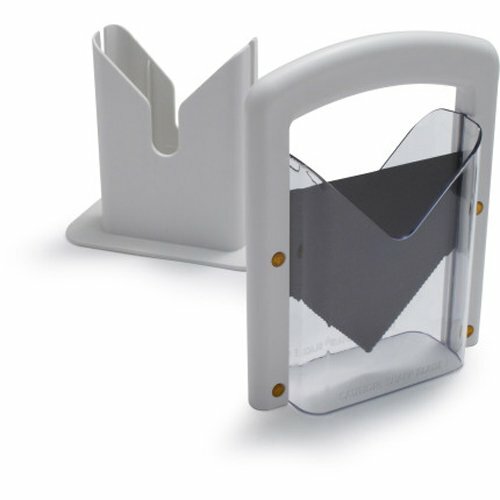 Save time and energy with this simple guillotine that will slice through your favorite kind of bagels, muffins or rolls! With its safe handle and protected blade, you can feel safe slicing your bagels. This durable product allows you to effortlessly slice your bagels in half in three easy steps! Simplyadd your food of choice, grab the hand at the top, and push down for the perfect slice, everytime! PERFECT FOR BAGEL LOVERS - This tool is an easy solution to your morning breakfast. It makes cutting your bagels in half very safe, easy and time-saving. 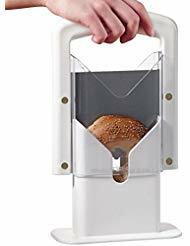 EASY TO USE HANDLE - Simply lift, place your bagel or muffin, and lower the guillotine through your bagel! In three easy steps, you will have that perfect slice. NO MORE CUT FINGERS - Your fingers will never come into contact with this blade! Its efficient safety cover makes slicing your bagels much safer. SMOOTH SLICING - Get the perfect cut every time. 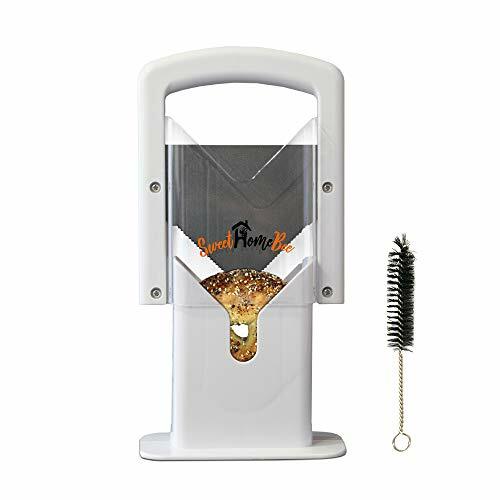 This durable tool will be the perfect addition to your home. MULTIPURPOSE TOOL - Not only for bagels! Use this product for slicing muffins, rolls and bagels of all sizes. Do you love bagels but afraid to slice them? Then our Bagel Slicer is perfect solution for you. It's fast, safe, and easy to use. Efficient, effortless tool slices bagels in few seconds to save you time. It's safe for all family members including kids and teenagers putting parents mind at ease. Not only bagels, this slicer works for Muffins, Buns, Rolls, and Breads. 100% Satisfaction guarantee! Our high quality bagel slicer with stainless steel serrated non-stick blade is backed by 30 day money back guarantee. 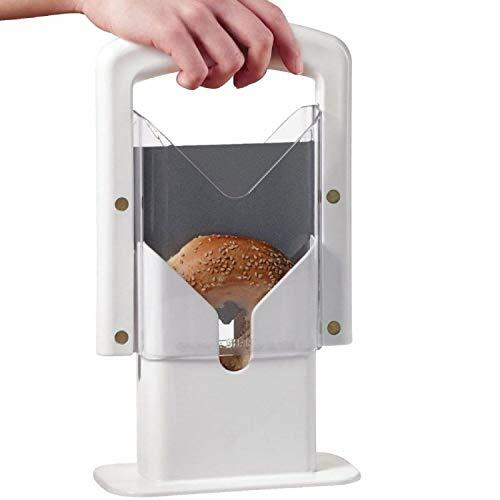 Click 'Add to Card' to buy this high quality Bagel Slicer. FAST AND EASY: Efficient, effortless tool slices bagels in seconds. Very easy to use. It will save you a lot of time. SAFE: It saves your hand, finger, and trips to ER. The stainless steel serrated edge knife blade is protected so there is no chance of cutting hands and fingers. Safe for all family members including kids and teenagers putting parents mind at ease. PERFECT KITCHEN GADGET IN HOME AND OFFICE: Perfect, smooth slicing. Perfect for family breakfast, office meetings, and social gatherings or as a gift. MULTIPURPOSE TOOL: Not only bagels, this product works for Muffin, Bun, Roll, and Breads. NONSTICK, DISHWASHER SAFE, HIGH QUALITY. 100% Satisfaction guarantee with 30 day money back guarantee. It is simple and easy for kitchen use. It is also easy to cleanup the bread slicer and it is easy-storage and space-saving. It keeps your fingers away from the blade when you cutting bread, and you don't worry about cutting your fingers. It is suitable for slicing bread, toast, bagel,sandwich and loaf, it can also be used to cut ham, cheese and vegetable. Material:high quality and safe ABS resin. Heat Resistant Durability: -10 C~90 C, non-toxic and durable. Adjustable,allows you to slice 4 Different thickness-1cm/2cm/3cm/4cm. The bottom of slicer has the anti-skid design,delicate designed, strong and tenacious. Foldable,easy-storage and space-saving and easy cleanup. "Nothing tastes quite as good at breakfast time as a fresh bagel. After getting home from the bakery with your new find, you realize that you still have to slice it up. You don't want to sacrifice quality by trying to do this free-handedly but you need to speed things up sometimes to make sure you're done with everything in time. 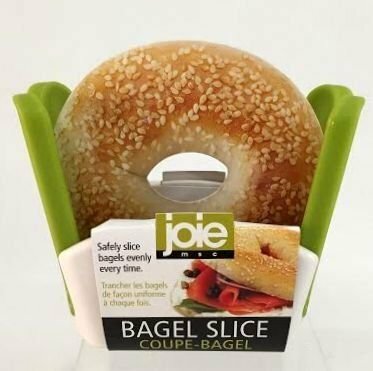 When prepping your bagel, make sure you get two even slices when you use this Joie Bagel Slicer. The unique style of this cuts into the thickest bagels, handling each one perfectly with guards on either side to keep the bagel in place as you push it down. If you want to get that bagel toasting right away, add this to your food prep tools to make one job quicker so you can get cooking." SHARP EDGES: Made of stainless steel for durability, the blade evenly create each slice for a delicious breakfast. SIDE GUARDS: The slanted edges keep the bagel centered at it cuts through the middle. SIMPLE: With one swift push, you're done with the all the chopping and cutting so you can move on with the dish. EASY TO STORE: While not in use, fold the arms down and make it more compact and protected so others won't be accidentally injured by the blade. MADE BY JOIE: This product is ensured to be the same high quality you love and have come to expect from Joie. It is professional for kitchen using. It is strong, durable and great to made potato chips, vegetables or melon slice. Ergonomic design for comfortable handling.Easy to use and to operate. 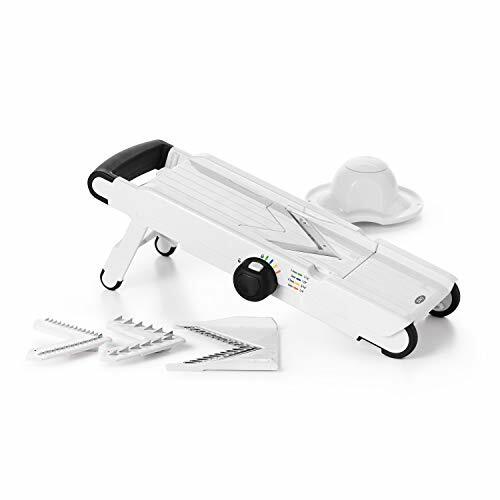 Premium Bamboo Foldable Bread Slicer Built in Crumb Catcher and Knife Rest |Bread Slicing Guide, Bread Loaf Slicer BONUS Bamboo Butter Spreader, Storage Bag and Guide Book. Do you face below problems? Are you frustrated of not being able to slice your homemade bread evenly? Do you need to clean your table/ counter every-time you slice bread? Are you afraid of cutting your finger when slicing bread? We are pleased to present Kitchen Natural's Bamboo Bread Slicer to make your slicing perfect. Many people believe bakers are the ones who can make even bread slices but we present a solution for everyone to slice their bread at home and make even bread slices with different thickness levels. We present the foldable bamboo bread slicer with built-in crumb catching tray and knife rest. Kitchen Naturals bread cutting guide will be ready to slice bread in just a few seconds. You won't have to clean the table after slicing as the built-in crumb catcher tray immediately catch crumbs during slicing. 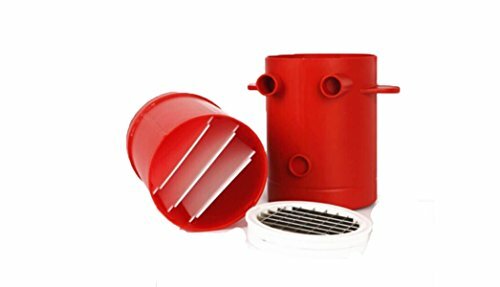 When you are done with slicing you can easily disassemble your bamboo foldable bread slicer, clean it, fold it flat, put into bonus storage bag and store safely in drawer/ cabinet. We have added a bonus bamboo butter spreader and guidebook to bake the perfect bread at home. All natural, 100% eco-friendly, antimicrobial bamboo. Choose the thickness of every slice. Three different size slices - 1/2" x 3/4" x 1.25". Sturdy backstop secures bread and guides in place. Textured non-slip feet firmly grip your countertop. Crumb catcher streamlines clean up. Designed for easy disassembly and storage. BONUS: Elegant Bamboo Butter Spreader FREE GIFT. BONUS: How to bake artisan homemade bread FREE BOOK. We back our product with a replacement & money back guarantee. If you are not happy with our product's performance, you can claim a 100% refund on the purchase price or in case of any issue you can claim replacement. 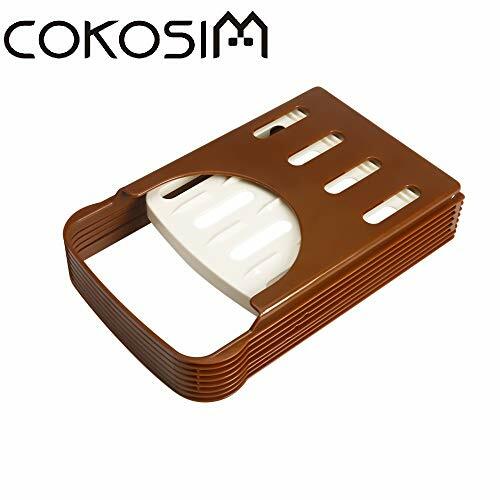 DURABILITY: We have used the highest quality bamboo wood in manufacturing our bread slicer guide which is natural and does not contain any harmful bacteria in it. Solid materials, smooth finish, compact design makes it perfect for everyday use. PERFECT SLICE: It's the perfect slicer guide for your homemade bread. It won't be a hard target to cut even slices. You will also have a choice to cut a slice of your desired thickness without risk of cutting your fingers. 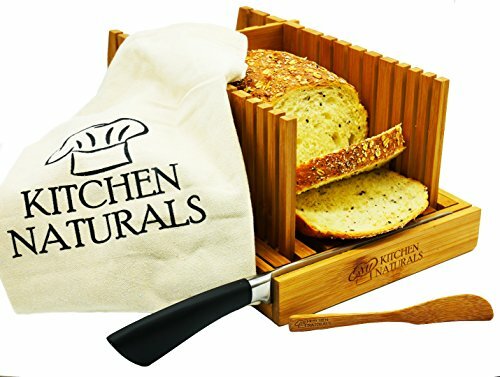 EASY STORAGE: Kitchen Naturals bamboo bread slicer comes with a knife rest and storage bag. You can easily make it ready for everyday use in seconds. When your finished cutting bread, you can easily clean and fold it flat to fit in your drawer. CRUMB CATCHER: We all are tired of cleaning crumbs after cutting bread every time from our table. We have equipped this bread loaf slicer with a built-in crumb catcher tray so you won't have to worry about cleaning your table anymore. GUARANTEE: We back our product with a replacement & money back guarantee. If you are not happy with our product's performance, you can claim a 100% refund on the purchase price or in case of any issue you can claim a replacement. Each part has a separate interior space, and a EVA that protects from scratches.You can store batteries, charger, remote control and other accessories. Made Of High-density EVA+300D Polyester with Anti-Shock foam Material For More Durable. 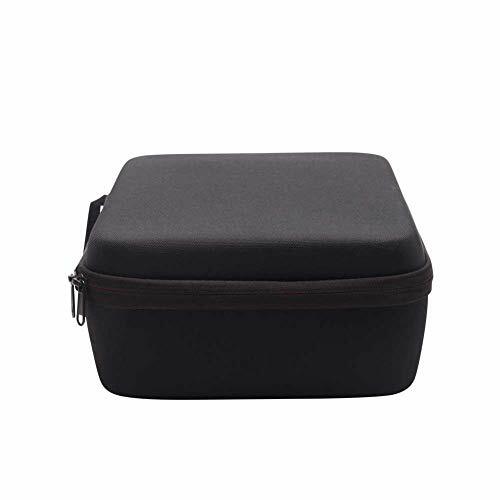 Ideal for travel or home storage.Waterproof storage bag. Precut EVA foam secures everything in place, protects against scratches, jostles and drops. The operation is simple: Simply place all the potatoes you want on the lower compartment and press the top shell. As the top house moves down under the pressure of your hand, the potatoes are cut into lovely pieces that can make microwaved French fries. Anything you want: Be creative when making sweet potato fries, zucchini fries, onion fritters, apple fries, and more. After taking it out of the microwave, you can mix different spices according to your taste, such as cheese and basil. Safety: Made of food-safe materials that do not contain BPA, safe and non-toxic. The material can also be used in microwave ovens. Fast: The accessories are optimized to fit most potatoes, regardless of size. What's more, it doesn't require considerable pressure on the fries, and then it's popular in microwave ovens within a few minutes. Delicious fresh crispy fries are done. Package includes: 1* potato slicer. Quality Materials:It is made of high quality ABS resin,non-toxic, no smell,good toughness. 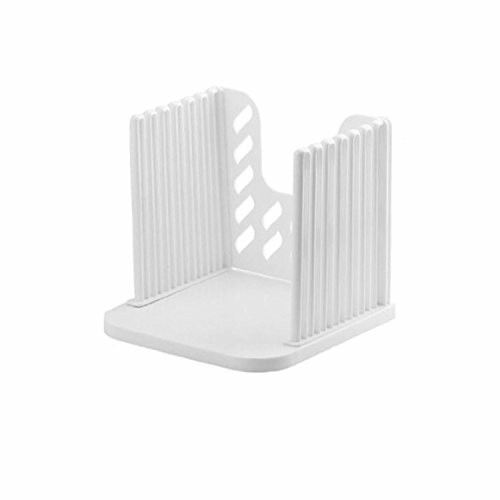 Multiple Choices:Adjustable,allow to make 4 different thicknesses bread, 15mm/20mm/25mm/30mm. Anti slip design:The bottom of the product has outstanding non slip point.Hollow and good permeability. Easy to collect :Foldable, Easy-storage and Space-saving. Nrpfell is a legal brand which has already been registered. Unauthorized sellers are not allowed to sell products under Nrpfell. Nrpfell is dedicated to provide customers with high-quality products and best after-sale service. With Nrpfell, you will gain unprecedented comfortable shopping experience. 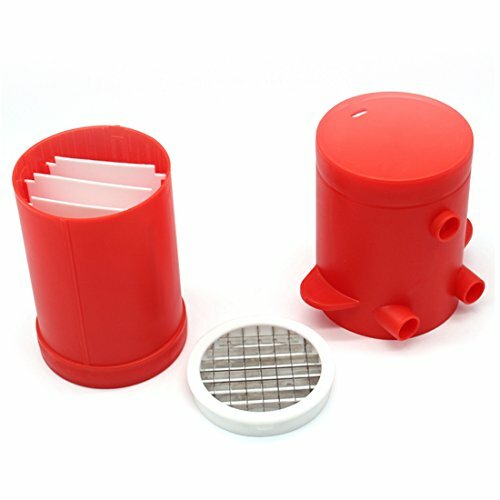 microwave fries machine potato cutting machine fries cutting and baking machine potato slice baking machine Jiffy Fries Remove the blade part, the microwave oven is forbidden to put metal products Explanation: Name: potato cutting machine color: red Material: plastic; silicone Size: 17x16x11.5 Product Category: Kitchen Gadgets Save time: no need to peel by hand; chop and slice; the design of this cutter is cut with crisscross plate; effortless and uniform; every time can get perfect effect; Jiffy fries provide you with fast and convenient Way to quickly make fries. Create different raw materials and different flavors of French fries: In the production of sweet potato fries; zucchini fries; onion fritters; apple fries, etc. ; You can create a creative microwave; you can mix different spices according to your taste. 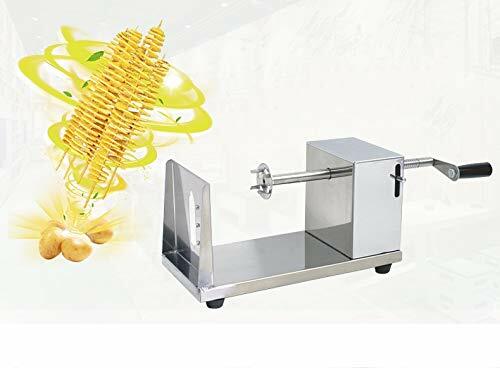 package 1x potato cutting machine Only the above package content, other products are not included. Note: Light shooting and different displays may cause the color of the item in the picture a little different from the real thing. The measurement allowed error is +/- 1-3cm. Cutting potatoes of different sizes; Microwave ovens; Delicious French fries in just minutes. safe and non-toxic; the structure of the dishwasher is safe and durable; the material can also be used for microwave ovens. 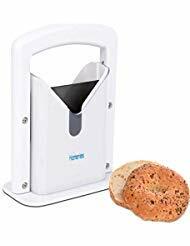 EFFORTLESS SLICE BAGELS: The Hoan Bagel Guillotine Slicer allows you to safely and effortlessly slice bagels in half. KEEP HANDS OUT OF HARMS WAY: This bagel slicer keeps your hands away from any potential slicing harm. There is a slot where the bagel will rest and then simply push down on the blade to obtain the finished product; a cleanly sliced bagel. BUILT IN SAFETY SHIELD: The cradle holds the bagel while the two clear acrylic safety shields keep fingers away from the patented piercing blade. USE FOR DIFFERENT TYPES OF ROLLS: This slicer is not limited to just using on bagels. You can use this to slice muffins, buns, and rolls of all sizes. SMOOTH SLICING AND DURABLE: The bagel slicer features a precision ground serrated cutting edges and a non-stick Xylan coated blade for smooth slicing and durability. With this bagel slicer, you will eliminate any uneven and mess cuts. Warranty: Satisfaction guaranteed. If for any reason you are not satisfied with an OXO product, return it for replacement or refund.